This week marks the beginning of Fall, a season I am ridiculously excited for. Falling leaves, cold breezes, dark polishes, Halloween candy, thick scarves, everything signals change and the start of something new. 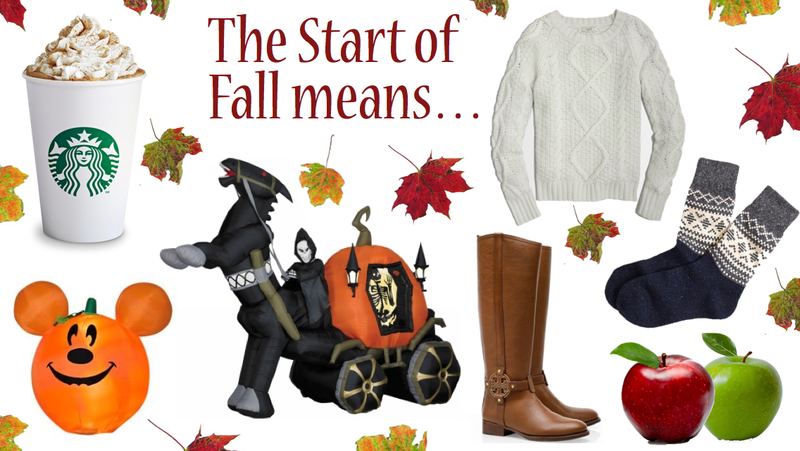 The start of Fall means a lot of things to me, including the return of many Fall favorites. Here are some of the things I am most excited to see return this Fall. Pumpkin Spice Lattes – The delicious taste of Pumpkin is back in my coffee and in my tea and I’m all excited for the change. I love Pumpkin everything and that first taste of Pumpkin in my coffee is the official start of Fall for me. Halloween Decorations – There is little that I love more than decorating for the holidays and decorating for Halloween is no different. I love to string up the fake cobwebs and litter them with fake little black spiders. There are pumpkins everywhere in my apartment and one of these years, I will get one of those blow up lawn decorations to display that I have always lusted after during many a Fall Coscto run. Cosy Sweaters – Fall means the return of one of my all time favorites, the cosy sweater. When the weather turns chilly, I love pulling out my pile of comfy sweaters in varying colors. I’m usually wearing one over every single outfit in my closet and each of them is like a warm hug. Thick Socks – For the days when you know that it is just too cold to get out of bed, the solution is to immediately throw on the thickest pair of socks you have and let your toes get cosy. I feel warmer all over when my feet are cosy and I like to ‘risky business’ it around the apartment sliding to and from rooms in a happy Fall daze. Fall Boots – I’m all about two kinds of shoes in Fall. Fall flats & Fall boots and I’ll have to admit my favorite is definitely a good pair of Fall boots. Every year, I buy a pair of Fall boots that are cute and inexpensive, but quality wise, barely last the season. This year, I’m determined to invest in a really good pair of Fall boots that will carry me through the Fall seasons ahead and always be in style. It’s my new Fall mission. Apple Picking – Apples! Apple picking, Apple cider, Apple pie, Apple muffins, Apple strudel, Baked Apples, everything Apples! Fall is all about Apples and I am more than happy to oblige. I have made many a delicious baked good using apples in past Fall seasons, but this year I am planning on heading to an orchard to take in the brisk air and to hand select my own apples. Have a Fall favorite of your own that you can’t wait to see back in rotation? Share them with me in the comments below! I'm looking forward to the pumpkin patch and apple picking!